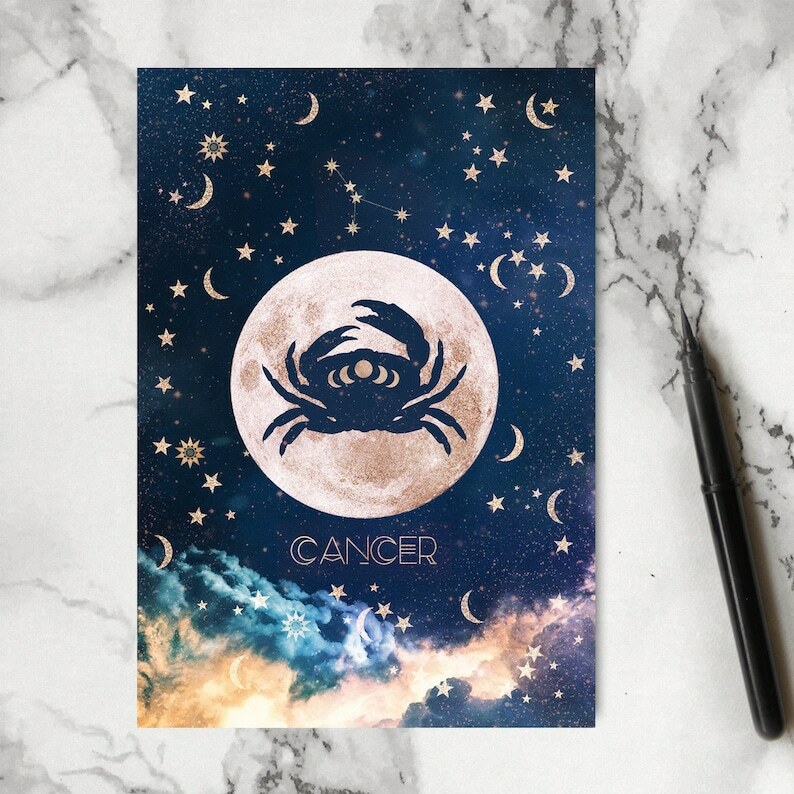 This lovely notebook features the Moon and the Cancer Zodiac sign and Star Constellation. 'Cancer is the Fourth astrological sign of the Zodiac and is the natural nurturer of the horoscope wheel, Cancer is ruled by the Moon. This notebook would be perfect for writing your intentions, dreams or thoughts during the different phases of the Moon. Please note this design has an aged/textured filter applied to give it a vintage appearance. The notebook is A5 with a beautiful printed full colour cover (300gsm card), stapled squared spine, and 36 plain pages ready and waiting for your thoughts and dreams. The notebook is made from 100% recycled paper. Very good quality and very pleased with the delivery! We accept payment by Paypal or debit/credit card, as well as Etsy gift card. If you wish to cancel your order please contact Baltic Moon as soon as possible. Once the order has been dispatched then a refund is only possible once the item/s have been returned in saleable condition. If for any reason you are dissatisfied with your purchase please contact Baltic Moon within 14 days of receipt, to arrange an exchange or refund. Please note that all items must be returned in perfect un-used condition. A refund for the item will then be processed once returned. Return postage is the customer's responsibility. Please contact Baltic Moon first before leaving negative feedback, we will do all we can to resolve any dissatisfaction. We will dispatch orders between 2-5 working days after payment, we post on Wednesday, Friday and Saturday. If you need an order ASAP please contact Baltic Moon and we will try our best to fulfil your request. As our scarves and kimonos are only printed in very small runs (some limited edition) they are all sent using Tracked and Signed services. UK delivery is by First Class Royal Mail Signed For. International delivery is by Tracked and Signed for Airmail. Please allow up to 3 working days for delivery in the UK, and up to 15 working days for international delivery. Please note delivery may take longer during peak holiday seasons (Black Friday/Christmas/New Year). Once your order has been dispatched we will update the status and advise by email that it has been posted. Please be aware of any postal strikes or delays in your locality; We can't be held responsible for late delivery if it's down to a known issue with the postal service. It is the customers responsibility to provide the correct address. If an order is sent to an incorrect/incomplete address or is refused at the address and is sent back to Baltic Moon, it is the customers responsibility to to pay if they wish the item to be resent. Any customs charges incurred are the sole responsibility of the customer. It is the responsibility of the customer to check any relevant customs charges, tax or duty, which may be payable in their own country before placing an order. By placing an order you are agreeing to this policy. All images have been created by Baltic Moon using digital collage. Baltic Moon retains all copyright over finished products.